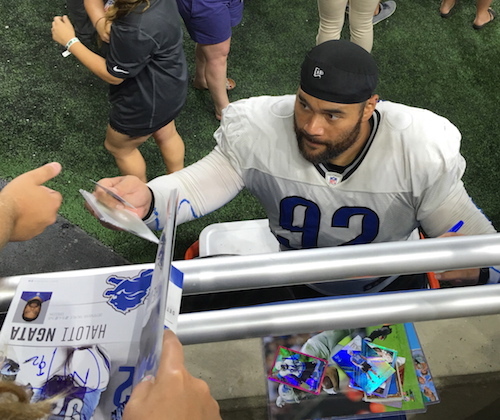 Here is an iFolloSports.com original photo of Detroit Lions defensive tackle Haloti Ngata signing autographs during a recent Lions training camp event at Ford Field. The picture is provided by Lance Martinez of My Detroit Sports. The 32-year-old Ngata was traded to the Lions in 2015, after spending 9 seasons with the Ravens. During his tenure in Baltimore, the Oregon alum was selected for 5 Pro Bowls, while serving as an integral part of the franchise’s Super Bowl XLVII victory over the 49ers. For his career, the 2006 first round pick has amassed 469 combined tackles and 28 sacks. Lions fans can also view numerous other iFolloSports.com original stories, featuring the club, during the last few years.